American professional wrestler (Jonathan Good) wrestles with the WWE as part of 'The Shield'. When asked how tall he was, he once said "It depends on who you ask....I'm Six-Two or Six-Three...I guess, maybe"
Rob, do you think Ambrose has a large head which makes him appear shorter? Longer than average, but not what I'd call Huge for his height range. Dean Ambrose is pretty much the same height as Seth Rollins, they’re both about 6’0.75”. Reigns is an inch or so taller than them both at 6’1.75”. Just call me Manpreet, because his website name in cagematch that stood 6'3 190cm. That could be his real height. Ambrose billed height in WWE is 193cm, real height is 190cm. You'd be surprised at how many people genuinely believe that they're an inch or two taller than they really are. Not everyone who exaggerates height is lying on purpose. A solid 185 cm . True. But yet he's still listed 6'4.5" here for some reason. Look at the face off between Orton and Jinder from back in 2012. Go to 0:51 secs. Jinder possibly has boot advantage and he is shorter still. Jinder is 6'3.5 at most. Always looked 6'1 to me, just slouched a lot due to his character, very much like Heath Ledgers Joker. You should update to his new look Rob, since returning Dean looks bigger physically. Also his new Bane style jacket makes him look more physically imposing. Also, because the average guess is 6'1.09 for Dean, would you consider upgrading his height to a full 6'1 now? Ambrose (in my opinion) is a legit 6’4” tall. He just slouches a lot that’s all. When? Just about every pic I see, Randy either edges Jinder or they're the exact same. I think dean is 6ft 1.5 or 6ft 1.75 because I’ve seen and picture of him standing up standing up straight he maybe the sort of the same height as Chris Pratt or just below because in another picture he does look between Seth and Roman in the middle. @Christian 6'5 3/8" Jinder did look taller at one time don't quite remember when it was. I know, I don't get why some people still think it's the opposite. Orton is taller than Mahal I'm certain. Lol and to think people actually believed he's 6'4. 184 is the most I'd give him now. Looked a good 4" shorter than 6'4.25" McIntyre. Looks somewhere from 6'0.5"-0.75" if you see him next to Drew McIntyre. @Rob Mahal is billed at 6'5 by WWE. Considering he's around that mark I'm surprised he wasn't billed at 6'7 by their normal standards. @Ali The funny thing is Ambrose is billed at 6'4 which Mahal clears so he's towered by him. They don't even give him appropriate footwear to look near that height which makes it even more ridiculous. If Dean is 6'1 as average guesses suggest, how tall does that make Jinder Mahal? Here is a segment he and Dean had this week on RAW. Mahal looks at least 3 inches taller than Ambrose, putting him in the 6'3.75 to 6'4 range and he is often listed as 6'5 and has been described as a big on their SmackTalk shows. Take into account his turban does add make him look taller as well. What do you say Rob? Mahal at 6ft 4.5 is possible, his 6ft 6 billing was always a bit much. rob shouldt you put up his claim from thata audio file where he says " im 6`2-6`3 i guess"
Yes, I've put it at the top now. Any man who uses 'I guess...maybe' is lying about their height. Oh and Dean as I've stated in earlier posts is 6'0.75. I think Rob keeps him this way because Seth Rollins (6'1) you can tell has a little bit on him..
Curtis Axel was at least an inch shorter than 6'2.5 Alex Riley back in the day. If Kevin Owens is 5'10, I see Dean around 6' even. He always appeared a weak 6'1 to me, his posture is all over the place that's all. When he is stood much straighter he can go from looking 6'0.5 - .75 to a full 6'1. That is a good height for a wrestler and an actor, give him simple trainers or dress shoes and he would be in the 6'1.5 to 6'2 range. @heightchecker34 Ambrose did edge out Miz a lot during their feud but there was a segment where he looked the same as Miz. Unfortunately I cannot find a video or a picture of this. As for Sami Zayn, to me Zayn can look a weak 6'0 and Ambrose did always edge out quite a bit. As for Fandango, Zack Ryder and Curtis Axel, I cant find any decent photos or segments of either but I would say Axel would edge out the latter. Hope that helps. Rob, who do you think would be taller between the three: Dean Ambrose, Sami Zayn, or The Miz? They all look close to 6'1, but taller than 184 cm. I think the result would be interesting. My money is on Ambrose. He just slouches to much, but when he stands tall, he is very close to 185 cm. And I wonder who would stander taller between these three as well: Fandango, Curtis Axel or Zack Ryder? They all look 6'1.5. I think Zack Ryder holds great posture, so I might lean towards him. Thanks! 6'0.5" is more like it. Rob,you have to upgrade him to 6'1". Yes i knew it he wasn't 6'4 because i saw the raw video when the shield reunited dean was standing next to roman and he looks shorter than roman so i was right! @Ricky Yeah, can't see Ambrose being under 6'1", he towered over AJ Styles and Dolph Ziggler on Smackdown. The average guess of 185.6 cm is perfect for him. Rob,please tell me what makes you believe that Dean Ambrose is not completely 6'1". Editor Rob: it's just an estimate, there is of course a chance he can look 6ft 1 range...someone like Seth Rollins can look about 6ft 1 with Billy Gunn, who I would say is close to 6ft 4. Between 6'1" and 6'2" is fine for Ambrose, IMO. If I had to be specific though, I'd go with 6'1.5", guess you could call it intuition. Was Ambrose billed at 6 feet and 6'2"? Thought WWE always listed him as 6'4". You are making outlandish claims. During sheild's debut Dean' billed height was 6'.0'' and in 2015 Dean's billed height became 6'.2'' and now currently in 2017 wwe bills him at 6'.4" But that makes no sense how can a person's height increase after becomeing adult . WWE wrestlers have billed height which are fake. Height billing means adding minimum 2 plus inches tp real height . I am saying Dean is short to my opiniondean should be a strong 5'.10" guy which is not at all short. dean ambrose has the same height of seth. His around Roman's height, this is way to short. He is not 6'0.75",he is not shorter than 6'1". I think 6'0.75" or 6'1" is correct Rollins seems 6'1.75" and Reigns 6'3"
He's completely 6'1" not 6'0.75". He and Seth Rollins are equally tall. I sometimes feel that both Dean and Seth are a bit more than 6'1" maybe around 6'1.25" but not sure about it. he is about 6ft3 during a flim with triple h he look about a inch taller. I would say 6'1 at tallest and 6'0.5 to .75 when slouching. Descent height for a wrestler but perfect for movie actor. Might be around 184-185cm but hard to tell his height exactly. At times he look the same as Cena, yet sometimes he looks a bit taller than Rollins. Brock's got 1.25-1.5 on him. even with the slouch he doesnt look shorter than 184. i am 100 procent shore that he is atleast half inch taller than peak ford. i would say a full 6 foot 1 seems more realistic. Lol @ some of these guesses. 6'3, 6'4. Look at him next to Brock Lesnar (or triple h even) and tell me he's 6'3 or 6'4. I really believe he's 6'1 at the very very most. He's clearly 6'0.75. I think Rob has him pegged pretty good. Big fan though. I take that back, he might be a solid 185 guy, just seems a bit shorter because of bad posture. 6'1 he looks most of the time. Slouches a lot though. Tallish guy , I'll never know why WWE listed him with 6'4 , Reigns always looked taller than him, and also Rollins with his good posture . Max I could give him is 6'2. He should not be over 6'1 but some places looks around 6'3. Hey rob how tall do you reckon his wife Renee young is. I've read 5ft5. Any chance of adding her? He fought Kane 1 on 1 in his S.H.I.E.L.D days, he was at most 3 - 4 inches shorter, they were closer in height than you think. 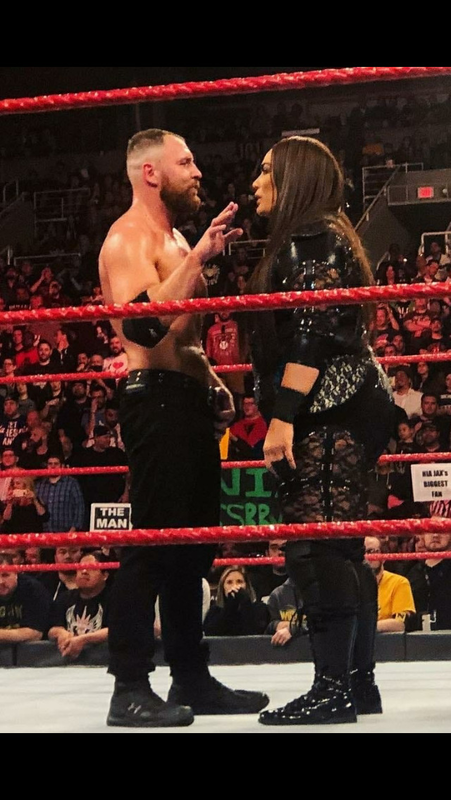 People saying he is shorter than the Miz is ludarous. He is 6 ft 3.5 - 6 ft 4. My initial impression on Dean's height was 6'2", he does kinda look it whenever stood up straight to be fair. He's probably closer to 6'1" though, there's only a minor difference in height between him and Rollins. The main issue with Ambrose is his posture, it isn't very consistent which is why his height is so difficult to gauge. can appear 6'0.5 a lot due to bad posture, when stood straight looks taller like 6'1. in his jon moxley days he was listed as 6'3 a lot and could appear fairly tall, but that was because he was wrestling a lot of smaller guys back then. Dean is clearly shorter than The Miz like I've said before? Dean has more footwear too, Are you convinced yet Dean is 184cm? he looked 6'1 with strowman on raw. Rob, would you consider taking down Ambrose to at least 184cm? I've met Ambrose on multiple occasions and he's under 6 ft. He appears taller on TV due to the boots. Here is 6'4 listed Ambrose with a true 6'4 Orton. I would say 6ft 0.75in is pretty much bang on given he is standing slightly further back than Orton, 100% not the 6'4 he is listed as haha. On past raw shows mick is 6ft 2 and his clean self a few raw shows ago he looks 6ft 3 with his shoes on and in the past dean looks right about his height standing next to him so would you think dean is still 6ft. 0.75 or abit taller cause he looks the same height as mick foley I'm guessing 6ft 3 then WWE add 1inch like the normally do. Rob tell me what is his weight lets say from 83 to 105 kilos i would say 90kilos and you rob what you think ? Editor Rob: between 90-95, somewhere in that range I'd say. Rob, do you know why this guy is listed at 6 ft 4 when Seth Rollins is listed at 6 ft 1? That's because he asked a 6 ft 4 listing? Or because Vince said you are too thin, better to list you taller? Editor Rob: maybe an 'honest mistake'...it's understandable 1 inch errors, but 3 inches is a lot to stomach. Stands too tall next to Roman Reigns to be anything but a legit 6'1'' guy. Everyone keeps saying how Ambrose is shorter than Cena, but the fact is Ambrose leans forward pretty much all the time. If Triple H is still 6'2(1.88 m) then Dean can be 6'1.25(186 cm) when standing straight. What do you say Rob?? What you think is dean ambrose weight from 84kilos to 100 kilos ? Ambrose has never looked taller than Cena in his life! There's only one moment where Dean looked shorter than John Cena, and in that one moment Dean was slouching so much that it looked like he wasn't even trying to hide it. Wouldn't call his footwear super thick, but they were maybe half an inch thicker than Cenas. In all other cases, Ambrose has towered over Cena by what looked to be 2". The Miz isn't exactly short either, standing at about 6'0". He was slightly taller than Al Snow(listed as 5'11" and seems legit) and very slightly shorter than Ryback(who always looked 6'1" to me. Michael Tarver actually looked like a legit 6'3" next to him). In all pics I can find of Dean Ambrose and the Miz, Ambrose seems to be much taller than the Miz in the ring and backstage. If you guys wanna put Ambrose down as 6'0" then that would put Ziggler and Miz at 5'8" and 5'10" and make the entire roster 2" shorter than they really are. You've got to be joking. John Cena was taller than Dean Ambrose, with less footwear! Cena was still taller than Ambrose! @Realist. I recall an interview between a few wrestlers on the shield and the push for roman reigns having to appear bigger, but couldn't because Seth and Dean were similar in height. I think they had Dean as being a bit taller than Seth and almost as tall as Reigns, so they asked him to slouch a bit during interviews, which was fine for him to do as it was always part of his characters that he played. For the most part, even he says it, he's 6'2". Next to John Cena who's listed as 6'0.5" here, Dean had looked mostly taller than him by more than an inch, but I didn't see two inches between them. With Orton it's hard to tell because of difference in footwear and it doesn't help Orton is a legit 6'4" guy, maybe even 6'4.25". I can't comprehend why he leans forward. It makes him shorter. At 177 cms I don't have that privilige. He looks 6 foot because of atrocious posture. Assuming he can maintain a decent posture, he's a full 6'1 in my opinion, maybe even slightly more. Strange though how he's being billed at 6'4 (tallest among the Shield members). @PotatoMcCain Well, to be fair. It is all WWE's listings they put down and we all know WWE likes to inflate their actual height, hell even deflate in some rare cases. Wikipedia put it down as "Billed" heights. Which means "describe someone or something in a particular, usually promotional, way, especially as a means of advertisement." I think he's 6'2.5, he leans forward pretty much 100% of the time which makes him look several inches shorter. lol Google and Wikipedia say Dino is 193cm... They should use your listings, it's wrong to lie to the people like that. @yoda: Ambrose was also shorter than John Cena. Cena was in those thin soled green/black sneakers, Ambrose had on a thick soled boot which looked near 2 inches! I think Rob has got this one wrong. Welaney, it's two separate pics of them made to look like a staredown. Welaney, I think the fangirl who runs that Instagram Photoshopped that pic. Miz appeared on Ambrose Asylum this Tues on Smackdown live and they both had slim footwear. Miz easily edged out Ambrose again. (Maybe someone can post a video, since it shows each others' footwear). I agree with Wrs567, Miz is taller than Ambrose. I thought Miz was only 6'0.5 and not 6'1 (and he was downgraded recently), so that means Dean should be downgraded as well. Rob, can you please downgrade Dean Ambrose Please? Please take a look at this video, and just go to the 20 second mark, Dean is shorter than The Miz! It's about time Dean Ambrose got taken down to 184cm, He was also shorter than John Cena when Cena wore thinner shoes! Here is an interesting photo of Dean with Roman in a staredown. This is from their Shield days and both did have similar footwear back then. It is all down to how tall Roman really is. Looks an inch and a bit difference. What do you say Rob? Look at dean near ryback at the tribute to the troops 2014 ryback is 6ft 1in or 2ins and you see dean looks 6ft 2 what do you think? Dean Ambrose is definitely 6.05(184cm), just 1cm under Seth Rollins. Slouches and is very chill with his posture...6 feet 1 for sure! He might be 6'1 or 6'2 not taller but wwe billed him as 6'4. dean said on unfiltered with renee young that he sees a chiropractor due to back problems. this could explain why he slouches a lot and can appear shorter. i would 6'1 when straight posture. Looks 1.86m (6'1.25) at best. Considering he has been billed 6'4 for years hell even before he joined the WWE and he has claimed around 6'3 and 6'2, he has to be at least 6'1. As many have said his posture is always out of place hence why he can appear shorter on occasion. The rare times he stands straighter he really towers over guys even the jacked guys. Looks to be in the 6'1 range. His posture does him no favours in some shots making him appear smaller. "Dean Ambrose's Height is 6ft 1in (185.4 cm)"
He's no shorter than Rollins. They're both legit 6ft1 guys, because both of them were noticeably taller than Cena. Ambrose, just like Lesnar, needs a quarter inch upgrade. When stood up straight he really is taller than expected. He just slouches a lot for character and, to me, because he has done this for years even before joining the WWE, he may have gotten too used to it that he doesn't stand at full posture in general. 6'1 at fullest and 6'0.5 to 6'0.75 max when slouching. Rob, how likely is the full 6ft1? Editor Rob: considering his posture at times, you could make a case that he may well measure it. Dean needs to visit the chiropractor and work on his posture. Jericho and owens aren't 6'0 though both are at max 5'10! 6ft1 on the nose I think for Ambrose. Rollins might have the edge but could be more 6ft1¼ range. Reigns could be 6ft2 flat and measured near 6ft2½. earlier in the day. He was a good 2in shorter than Orton. 6-0,5 for Dean Ambose now. About 1,25" shorter than Triple H (i have him at 6-1,75) in eqal posture. Him and Rollins both look 6ft1 range. He was billed 6ft5 so at one point I assumed he was at least 6ft3! I know I commented on Dean before, and I believed he was 6'0.75 range, now after a few more showings with John Cena, and him being a legit 6'05 guy. I think Ambrose at the very least 6'1. He easily looked an inch taller, and I doubt he is the kind of guy who wears lifts. I wouldn't be surprised if he was 6'1.5 inch... I know 6'0.75 and 6'1 isn't much difference, so I believe he wakes up as a legit 187 cm guy, and by the end of the day, especially after wrestling, he drops to 6'1. I just think, 6'0.75 is short changing him, despite his slouching and atrocious posture. My guess seems to be 6'1.25(186 cm) with good posture. @smoosh his height varies a lot, one of these days he will appear 5'8 lool but seriously to me he is 6'1.5 when stood up straight, he slouches so much despite having a big back and broad shoulders. Click Here - At 2:48, Ambrose looks significantly taller than both Cena and Wyatt. 6'1.5" is better bet with good posture for Dean Ambrose. @Korean As Jared said its standard in pro wrestling to bill a competitor 4 inches taller than then actually to make then sound physically intimidating. In Deans case, his 6'4 billing goes back to his Jon Moxley days on the indies. Eventually WWE will start to call him 6'3 or 6'2. To me he is 6'1 when stood straight otherwise 6'0.5 to 6'0.75 with terrible loose posture. How come his billed weight is 6'4...? Because WWE and pro wrestling in general tend to exaggerate wrestlers heights so they can seem bigger. This is one of the ways how these promotions make so much money. It sounds way more impressive to bill Dean as 6'4 instead of 6'1. Dean looked 187cm when he stood next to Shane McMahon, who is 184. But at times, Dean can look 184 as well. His height fluctuates so much that it's difficult to estimate his exact height. Here is a photo of Dean Ambrose with Dolph Ziggler. Dolph Ziggler used to be listed on this website as 5'11 and Dean isn't even stood straight and still looks around 6'1. What do you say Rob? Dean seems to stand around the 6'1 and slouches around the 6'0.75 mark, in my opinion. Dean looks closer to the camera a bit but still appears around the 6'1 range. Even in the movie Lockdown, Dean looked 6'1 and was stood with perfect posture which we rarely see him do on WWE television. A tricky guy, there is no doubt he slouches and has bad posture problem, however for the most part he always been max 6'1 and yet a bit taller than Cena (184 cm). I I disagree that he was purposefully looking small just to make Roman look bigger because its hard to do that on a consistent basis for the past 4 years. The entire Shield is within a few inches of each other. He always looks a bit shorter than Rollins (185 cm) in their encounters so the listing is fine. Still waiting for google to get rid of that ridiculous 6'4 listing. There is a picture of dean as US champ backstage with reigns and Seth been interviewed by renee Young it looks like he's The same range as both the other member of shield. He is easily a weak 6'1 just slouches a lot hence his posture is all over the place. As for weight Ambrose was definitely bigger and beefier in his Shield days and early singles career days, looked around 220 lbs back then. These days he seems to have upped his cardio and dropped some size like 20lbs hence he looks much more slimmer and leaner than his Shield days. Personally to me he looked better when he was jacked hopefully we will see him get those gains back in the future. @lol. you are wrong dean is 6foot flat. no more than that. What you think is dean ambrose weight between 185lbs to 220lbs ? Rob, which of these would suit him? Hey Dave Do you think Dean can be 186cm when standing Perfectly tall? Dean is about 185 cm. He's only 1 inch shorter than roman. Rollins looked taller next to Lesnar than Ambrose did. Plus he looks 3 inches taller than 5'9 Jericho at most. I would say 183-184 cm for Dean, he's always been the shortest Shield member, i don't understand how people fail to see that. Is dean ambrose is taller than seth rollins? sheamus is 6'4'' too. I want to see dean ambrose wear high heel, it's cool! I think 6'0" is better. Cena is a flat 6'0" and Dean looks of similar height. He is 6'0.5" at best but 6'0.75" - 6'1" seems too high. Standing next to Cena 6'0.75 for him is to high. A clear 6'0 for him these days. Seen him at the gym twice.I'm 6' 01" 230 lbs.He seemed same height as me and 20-25 pounds lighter than me. Rob, is the full 6ft1 possible? He can look pretty much the same as Rollins. Editor Rob: maybe because his posture is a bit loose at times he doesn't seem it, but you can't rule out a 6ft 1 range. Actually think Ambrose is around 6'2, slightly taller than HHH, Reigns and Rollins imo. What do people think of Owens? He has a large upper body which makes him seem quite big, but he was at least 1-2 inches shorter than Cena in his wrestling boots. 5'10? Rob, do you think he can hit the 6'1'' range mark out of bed?? Editor Rob: I'm sure he would clear it. shouldn't being 185cm make him 6'1? Jonathan is only 1.85m ? I thought he's got the same height like Roman Reigns. He seems a lot taller. i thought roman reigns is the tallest of the shield, maybe ambrose is wearing heel boots?! roman seems taller than ambrose when they have an interesting staredown onmonday night raw before survivor series. Backstage they all have all kinds of different camera angles and stuff. They even make the interviewers look shorter by making them take their shoes off or by putting the superstars on some kind of stool or something. Tom Phillips for example is the same height as Ziggler and taller than some superstars like Neville yet he always looks shorter than everyone. Is Ambrose wearing lifts possibly? Because he can appear as tall as Roman at times backstage when the two confront each other. I guess WWE wants him to wear lifts so that he can appear a legit 6'2, as a way to not make people think his height listing of 6'4 is bogus. Much shorter than Reigns and Triple H! Dean Ambrose cannot be 6'4" tall. Harper who is essentially 6'4" is significantly bigger. 184 cm sounds better for Dean Ambrose. Looks just under this mark, I would say 6'0.5 or 184 cm for Ambrose. He looks 'significantly taller' than the Terminator. Initially I agreed with the listing but now believe he is taller than Seth Rollins who wears pretty chunky wrestling boots. Could he be taller than 185 cm? been billed like that since day one lol obviously got the 4 inch added to his height. 6'0.5 max to me. It is clear Deans 6'4 billing goes back to his Jon Moxley days in the indies. Therefore it would be understanding for him to claim 6'2 or 6'3 in interviews to sound close to his billing. I would say 6'1 but slouches to the 6'0.5 to 6'0.75. He had an interesting staredown with Seth Rollins at Money in the Bank. Look at 9:40 to 10:30 you will see how Ambrose appears taller than Rollins and then both look the same height and then Rollins appears taller. It's as if they change height lol. It's kinda hard to tell, what do you think Rob? To me Ambrose is 6'0.5 but could be 6'1 in footwear and Rollins is 6'1 and maybe 6'2 in footwear. Don't forget Romans new boots have pretty thin soles, so Ambrose has the footwear advantage. His boots are quite a bit thicker. Dean is not a small person, he is around the 6'1 mark, give him thick footwear and he can tower many average sized people. And his physique is not bad at all either; broad shoulders, big arms, flat stomach, tank legs etc. If he dropped a bit more more body fat he would be cut up like Seth Rollins. Rob has his height nailed accurately. Ambrose and Reigns looked the same height on Smack down. @tk loool yeah in that dimension if roman was 6'3 then ambrose would be 6'4. but yeah reigns is definitely a 6'2.5 and dean is 6'1 but slouches down 6'0.5. both are still big dudes either way. But yeah to me Dean is a weak 6'1 and Roman is a little over 6'2. Always appears a weak 6'1 just slouches a lot for charcter, Jokeresque is you will. Rob has his height nailed perfectly. to me he is 6'1 in boots otherwise 6'0 flat and as for weight he looks around 220lbs, in the picture he clearly has a big upper body with big arms. i mean would they have him wrestle in a vest tank top if he was skinny? that would be totally ridiculous and clearly that is not the case with dean. I think he is about 6'0 and weights no more than 200-210. He is not some kind of muscle freak and has low bodyfat, no way he is as big as wwe bills him. But he's an incredible athlete! to me he is 6'1 but for has pour posture and therefore can look a flat 6'0. Could he be about 6'2" when standing fully straight? He has terrible posture but he doesn't look short. if the wwe are willing to go with a 6'4 billing for ambrose and he himself will claim to be around 6'2 to 6'3 then he is definitely more likely 6'0 to 6'1. he was in a swat style team that would need the memners to be tall to give them that intimidating factor. plus they were walking through the crowd and rollins said it was to how much bigger they were in person. also ambrose got given a role to play a cop in a movie. he would have to be a big and tall guy for that role. I stood next to him backstage and he's the same height as me, 6'1". 6'4" is rediculous. 6'2 isnt that outlandish a claim given he'd definitely measure around that mark in wrestling boots but 6'3 is definitely pretty extreme. He isn't shorter than 6'1''. Why does he claim 6'3'' though? I could see 6'2'' but isn't 6'3'' pushing it? He claims that he's shrinking, looking at the crazy things he did in czw, who knows? @Clim nice one dude, I wou say if he is making those claims he is more likely 6'0.5 to 6'1. There is no way he can be below 6'0. So yeah anything between 6'0 to 6'1 I go with.